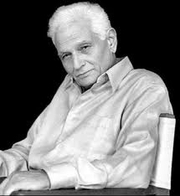 Jacques Derrida was the third of five children born in French Algeria to a Sephardic Jewish family originally from Spain. His studies were interrupted when the Vichy regime banned Jewish children from education during World War II. Derrida was fascinated by philosophy from a young age. In 1949, he moved to Paris, where he attended lycée and prepared for the entrance exam for the prestigious École Normale Supérieure. He failed his first attempt at this exam, but passed on his second try in 1952. Derrida entered the École Normale as part of a remarkable generation that included Foucault, Althusser, Lyotard, Barthes, and Marin. At the École Normale, Derrida studied philosophy and focused on the work of Edmund Husserl. He became particularly interested in analyzing the writing of philosophy itself. In the 1960s, he published several articles in Tel Quel, France's forum for leftist avant-garde theory, and wrote reviews of books on history and the nature of writing for the journal Critique. He developed a method of identifying patterns within the act of writing, which he termed "deconstruction." These would be the foundation of Derrida's highly influential work Of Grammatology (1967). Derrida was invited to the USA in 1967 by Johns Hopkins University, where he delivered his lecture "Structure, Sign, and Play in the Discourse of the Human Sciences," which won him international acclaim. He taught at the Ecole Normale Supérieur from 1965 to 1984, and divided much of his time between Paris and American universities such as Johns Hopkins, New York University, and Yale. He became the director of the École des Hautes Études en Science Sociales in Paris. In 1986, he was named Professor of Philosophy, French and Comparative Literature at the University of California, Irvine, where he taught until shortly before his death in 2004. He was involved in numerous political causes, fighting for the rights of Algerian immigrants in France, against apartheid, and for the rights of Czech dissidents. His works are among the most frequently-cited by other academics in a wide range of fields, particularly in literary criticism and philosophy. Jacques Derrida is currently considered a "single author." If one or more works are by a distinct, homonymous authors, go ahead and split the author. Jacques Derrida is composed of 29 names. You can examine and separate out names.